Muslim Minority Suffers Under Harsh Myanmar Rule Myanmar is a place of misery for many of its citizens. The repressive, often brutal military rulers of the country see to that. Political dissent isn't tolerated. And neither, it seems, is the country's ethnic Muslim minority, known as the Rohingya. NPR's Michael Sullivan offers this personal look at their plight. 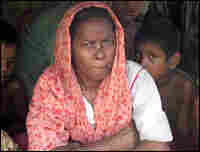 A Rohingya woman in a Muslim village in northern Rakhine state in Myanmar. The ethnic Muslim minority is oppressed by the Myanmar regime and subjected to racism by many in the Buddhist-majority country. 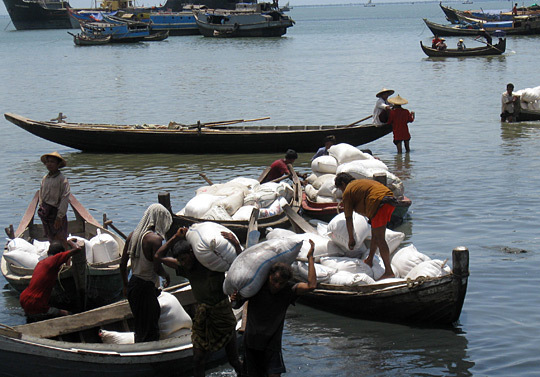 Muslims unload rice at the port of Sittwe, in Myanmar's northern Rakhine state. Nearly 1 million ethnic Rohingya Muslims live in the state, though many are fleeing repression by Myanmar's regime. 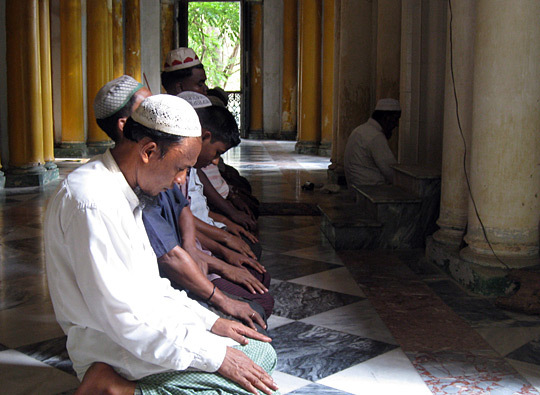 Prayers at a mosque in Sittwe. The Rohingya are denied basic rights, are not considered citizens and have no passports. Myanmar is a place of misery for many of its citizens. Political dissent isn't tolerated by the repressive, often brutal military rulers. And neither, it seems, is the country's ethnic Muslim minority, known as the Rohingya. NPR's Michael Sullivan visited the country and examined their plight. A friend brought me some pictures a few weeks back that were pretty disturbing. He works for an international aid agency, and the pictures were from a trip he took to visit some villages in Myanmar's northern Rakhine state, near the border with Bangladesh. The state is home to the Rohingya minority. He was showing me the pictures because he was outraged that people had to live in such squalid conditions. Some of the children were badly undernourished. Their mothers' faces were lined with despair. It was the despair in these women's eyes that got to my friend the most — the utter lack of hope. My friend, who doesn't want to be named — has been in this line of work for a long time, and he has seen places that he says he does not want to remember. But none have bothered him as much as this. "The Rohingya situation is very similar to a lot of refugee situations in Africa in the '80s and '90s," my friend says. "In the first four or five weeks, there's no water, there's cholera, there's other health problems. But what's different here is that it's been going on for a very long time. It's systematic oppression that's been going on for years." In some parts of northern Rakhine state, the global acute malnutrition rate is 25 percent. The World Health Organization considers 15 percent an emergency. It is a situation that many in the majority Buddhist community in Myanmar don't seem to mind. "I think it's fairly safe to say the military's approach to Rohingya is shared pretty widely throughout Burmese society. Trying to find the foundation for this level of hatred is very difficult," says David Mathieson, a researcher for Human Rights Watch. "Other ethnic minorities get treated very badly, but not to the savage extent that you see against the Rohingya. Not just being denied citizenship, but being denied they even exist," he says. There are an estimated 2 million Rohingya; slightly less than half still live in northern Rakhine state. Several hundred thousand more were driven out by the military in two separate purges — one in the late 1970s and another in the early '90s. Some now work in the Middle East. Some remain in camps in neighboring Bangladesh. Myanmar's government — and many in the Buddhist community — say the Rohingya people are from Bangladesh, and that is where they belong. Many Rohingya were brought to Myanmar from South Asia by the British while the entire region was part of colonial British India. But many Rohingya have been living in Myanmar for almost 200 years, if not longer. None of this seems to matter to Myanmar's military rulers. Their attitude toward the Rohingya seems a potent mix of xenophobia and racism. Myanmar's consul general in Hong Kong, in a letter to his colleagues in the diplomatic community earlier this year, wrote: "In reality, Rohingya are neither Myanmar people nor Myanmar's ethnic group. You will see in the photos that their complexion is 'dark brown.' The complexion of Myanmar people is fair and soft, good-looking as well." The Rohingya, he went on to say, are as "ugly as ogres." The Rohingya are denied even the most basic rights. They are not considered citizens and have no passports. They are not allowed to travel from northern Rakhine state to other parts of Myanmar. They are not even allowed to travel from village to village within the state without permission. Nor are they allowed to marry without permission and the payment of a healthy bribe. The border areas of northern Rakhine state are largely off-limits to foreigners, except for foreign aid workers. Foreign journalists are not welcome in Myanmar at all. On a clandestine trip to Sittwe, the capital of Rakhine state, I was struck by how easily and how casually many in the Buddhist majority accepted this harsh treatment of the Rohingya. At the Museum of Culture, there is a floor dedicated to the nationalities of Rakhine state, dozens of ethnic groups and tribes that populate the state. But there is not a single word about the Rohingya. When I ask my guide why, he doesn't hesitate. "They are not members of our community ... we do not consider them as part of us." More and more Rohingya men are choosing to flee the country in hopes of finding a better life elsewhere. Some made news late last year when several boatloads were intercepted by the Thai navy, towed back out to sea and set adrift. Regional governments do not want the Rohingya, either. Two men who recently fled Myanmar say Rohingya are treated worse than animals. For 39-year-old Ismael Lalu, the final straw was when the Myanmar military forced him to help build a new village for Buddhist settlers on Muslim land. It was what the Rohingya and many human rights activists call de facto ethnic cleansing. Lalu has now found temporary refuge in Malaysia — after paying smugglers about $500 to get him to Thailand. He still owes another $600 to the Malaysian smuggler who secured passage for him on to Kuala Lumpur. Another Rohingya, Dil Mohammad, 32, says he decided to leave after the authorities put his wife in jail for traveling to see a relative in a nearby village without permission. She died while in custody, he says. Activist Chris Lewa of the Arakan Project, which advocates for the Rohingya, says the men's tales are numbingly familiar. "Arbitrary taxes, forced labor, construction of Buddhist villages in Muslim areas, confiscation of land, religious persecution. And in that situation, I think a lot of people just hope to flee and find a better life somewhere else," Lewa says. That is fine with Myanmar's military rulers, who apparently would like nothing better than to see all the Rohingya gone for good. Human rights workers say that is why the military turns a blind eye to, or even encourages, the smugglers who take the Rohingya out. Human Rights Watch last month urged Myanmar's neighbors in Southeast Asia to press the military to end their "brutal practices" against the Rohingya. But it is a plea that is likely to fall on deaf ears. "Everybody's found a way to rationalize the prison conditions of the Rohingya," says my friend, the aid worker. "It's cynical, it's sinister and it's insidious." He continued: "I've been in these situations before, and I'm used to dealing with them. I'm rarely shocked by anything that happens. But after I came back, I realized I was walking through hell there. It wasn't a gray zone. It was hell for these people."